Welcome to Mount Dora, a quaint and charming historical city in Central Florida. Known for its antique shops, art festivals and museums, Mount Dora offers something for everyone. Enjoy fishing in the “Bass Capital of the World” or enjoy the quiet hustle and bustle of small town living. When it comes to entertainment in Mount Dora, the town is small but mighty. Start off your day by visiting one of the many area lakes, such as Apopka Lake, Lake Harris, Lake Eustis, and of course, Lake Dora. Take a boat tour in the Dora Canal to see if you can find some of our friendly feathered friends like ospreys, herons and egrets. For festivals, Mount Dora has something to offer almost every month of the year. From the Sail Boat Regatta, the Florida Storytelling Festival, the Mount Dora Seafood Festival, the Plant and Garden Fair, and the Annual Bicycle Festival, the community is always bustling. Experience Mount Dora by plane, boat or train by using some of the more fun forms of transportation offered around town. If small-town living gets too quiet, Orlando is just a 45 minute ride away to visit one of their major theme parks or the Orlando International Airport. If you’re in need of running errands or having a night of shopping, Stoneybrook Plaza, Tri City Shopping Plaza and Eustis Square Shopping Center are all nearby. The Elevate 155 Apartment Homes is a 5-minute drive from Downtown Mount Dora, off Interstate 441. Imagine living in an apartment community with scenic greenery, finishing your day watching the sunset from your patio, all while being just minutes from everything you’ll need. All members of the family are welcome, including the furry ones. Dogs will also soon be able to enjoy our bark park where they’ll be able to run around and play with other pups of the community. Residents of our apartments can enjoy our fitness center, resort-style pool or use our grilling area to barbecue. Floor plans range from 615 to 955 square feet with your choice of a one or two-bedroom apartment. Many apartments for rent include optional stainless steel appliances, wood-style flooring and granite style countertops. 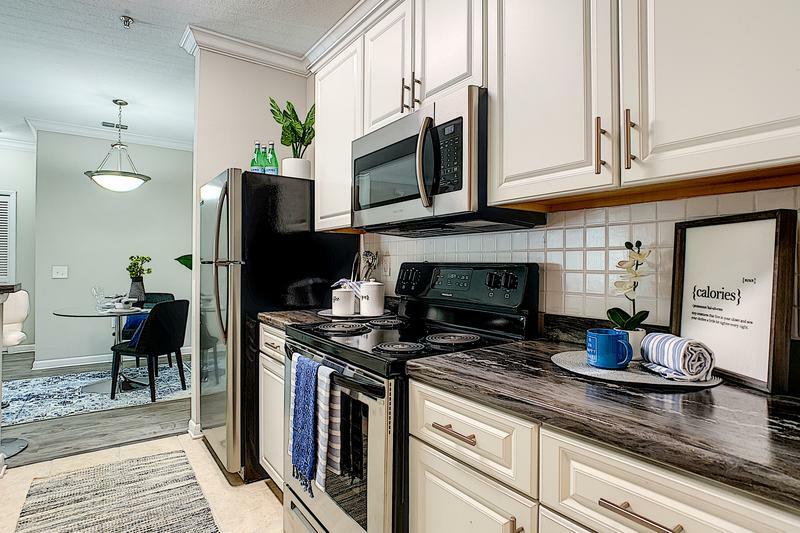 All apartments are designed to be open and spacious, so enjoy cooking your favorite meal with the counter space and room to entertain. Learn why the Elevate 155 Apartments should be your home and schedule a tour today.